Celebrating within a community is something we urge our TBI members to embrace. Starting with birth and throughout the life cycle, our members find the warmth of the TBI community enhances, enriches and deepens all family celebrations and provides support and comfort during times of sorrow. Mazal Tov! What a great joy it is to welcome a new life. Our rabbi and staff are delighted to share this joy with you and help you begin the journey of this new life. 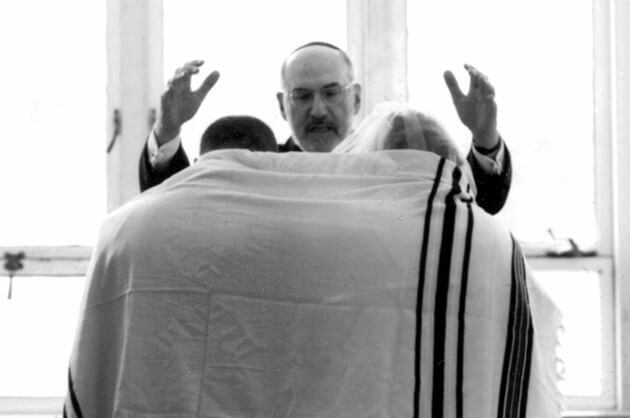 Traditionally a Jewish boy is welcomed into the covenant of the Jewish people with the ritual of Brit Milah or Bris (circumcision) on the 8th day of his life. The ritual is performed by a trained mohel or mohelet and often with our rabbi’s participation. We encourage families to reach out to our rabbi and staff to discuss options of mohelim and other details of this celebration. Our community space is also available for Brit Milah ceremonies. There is no specified time limit for bestowing a Jewish name although it is customarily done during the first year of life (after the 8th day). We welcome baby girls into the covenant with this special service that can be scheduled as part of our regular Shabbat worship or privately. A Naming Ceremony is also available for boys whose circumcision is private. Formal Jewish education is a sacred endeavor and so we consecrate the moment of its beginning. We celebrate Consecration with our Kindergarten class and those 1st and 2nd graders who are new to our school. We proudly present our students with a certificate and a miniature Torah—a symbol of the Torah on the path of life-long Jewish learning. Bar/Bat Mitzvah is a special and memorable event for your whole family in our community. The term Bar/Bat Mitzvah refers to a child’s coming of age in Jewish life. At age 13 a Jewish child has reached the age at which she/he is considered old enough to take on that set of privileges and responsibilities which we call Mitzvot (commandments or religious obligations). Bar/Bat Mitzvah is the religious ceremony at which a child and family celebrate transition. The ceremony includes the child’s publicly reading from the Torah scroll, participating in congregational worship, and symbolically accepting the Torah. B’nai Mitzvah dates are generally assigned to students in the fall of the 5th grade based on the student’s date of birth and family requests. Our 6th grade students and their parents participate in the B’nai Mitzvah seminar on select Sunday mornings during the 6th grade year. Students begin individual tutoring sessions with our B’nai Mitzvah tutor approximately six months in advance of their Bar/Bat Mitzvah. Those sessions are typically once a week for 30 minutes. During those six months students also study with a mentor, an adult in our community who is trained to guide each child through his/her parasha (portion) in English to ensure each student’s deeper understanding of the text. Students also determine a mitzvah initiative. Engagement in this initiative is an integral part of the process of becoming Bar/Bat Mitzvah. Approximately two months prior to their Bar/Bat Mitzvah, students begin meeting individually with Rabbi to discuss their understanding of their Torah portion and to prepare a thoughtful D’var Torah. The purpose of this address is twofold: first, for the student to express some of his or her feelings on the occasion; and second, for the student to relate a lesson from the Torah or Haftarah portion of the day to current life. Most of our families host a celebration in our Social Hall and our TBI Catering Committee is ready and waiting to help you make this simcha a beautiful and joyous celebration. For more information contact the Temple office. For more information, refer to the TBI Guide for B’nai Mitzvah. Confirmation is celebrated at the end of the 10th grade year, a time of growing independence for students. Each spring, all sophomores are invited to participate in a 6-8 week class with Rabbi. Together we explore the significance of being an adult member of the Jewish people and students reconfirm that association. The course culminates with the student-led Confirmation service. What joy to have found the person with whom you will share your life! Stand under the chuppah (wedding canopy) and break the glass at Temple Beth Israel. From choosing your ketubah (Jewish marriage contract) to deciding what parts of our Jewish wedding ritual are the most significant to you, our Rabbi is on hand to guide you and celebrate this very special ceremony with you. Temple Beth Israel is here to support our members at a time of loss and grief. Whether a death is anticipated or comes suddenly, the pain and trauma of loss is difficult and we are here to help. Please contact Rabbi to make funeral arrangements when a loved one passes away, or to discuss funeral concerns or needs at any time. Rabbi will meet with you to explain Jewish burial and mourning customs and to plan the funeral with you. Temple Beth Israel has a funeral plan with Chicago Jewish Funerals. Rabbi will assist you, as a Temple member, whether you use that plan or any other provider you choose. The days following the funeral are known as Shiva. Following the funeral, family members gather for a Meal of Consolation and the beginning of the Shiva period. Temple Beth Israel’s Mitzvah Corps is available to assist with this meal upon request. Rabbi will discuss with you what Shiva will mean for your family. Rabbi and/or Temple members can be available to lead a minyan (evening service) at the house of mourning. It is a Jewish tradition to put a marker or tombstone at the gravesite. This is typically done within the first year, 30 days or more after the burial. There is a modern American Jewish custom of holding an unveiling or dedication service at that time. Rabbi can lead this service or you can choose to conduct it yourself using our TBI Dedication Service as a guide. Yahrzeit is the anniversary of the death of a loved one. Some of our members choose to observe the Yahrzeit according to the English date of death and some choose to observe the Yahrzeit according to the Hebrew date of death. Our congregation will send you a notice each year and we will read the names of your loved ones at the appropriate Shabbat service. Many of our members find comfort in attending Yizkor services. We recognize that mourning is both a personal and a communal activity. This is an opportunity to come together in prayer and reflection. This special service is held four times a year – on Yom Kippur, on the last day of Pesach, on Shavuot and on Sh’mini Atzeret/Simchat Torah. Many of our members choose to remember their loved ones with a memorial plaque in our Temple sanctuary. Please contact the Temple office to purchase a plaque. The warmth of our community enhances all family celebrations and provides support and comfort during times of sorrow. From delivering soup to the ill to offering assistance to those who need it, the Mitzvah Corps provides an invaluable service to our community. We are always looking for others to join us. Are you interested in Judaism? Perhaps you were raised in a different religion—or with no faith—but you live as part of a Jewish family or Judaism just feels “right” to you. To learn about options for joining the Jewish people contact the Rabbi. He will personally guide you on your journey educationally and experientially. Our congregation also warmly welcomes the participation of interfaith families. If you have any questions or concerns—or just want to talk—please feel free to contact the rabbi. Whatever the circumstances, the Temple Beth Israel community warmly welcomes you.